Aside from the staple stew, adobo (which I plan to blog about soon), this fragrant curry dish is also very quick and simple to prepare. Since this is spicy, only J and I get to savor this at home. We prefer this red curry for chicken, and the yellow curry for beef. 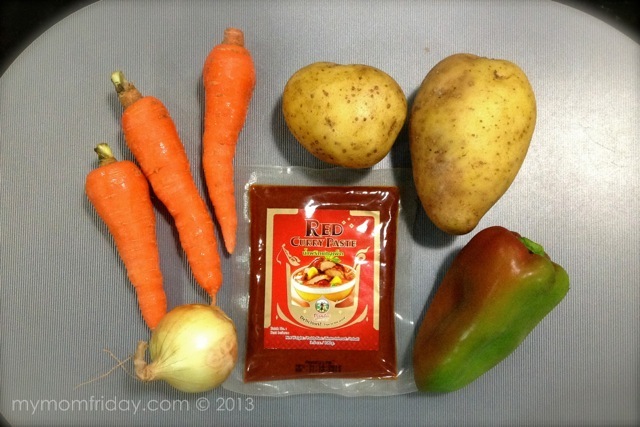 It does look very much like chicken afritada, which has a tomato-based sauce and the same mix of veggies. I have to admit, the star of this dish is really the Pantai Red Curry Paste which lends the exotic flavor to the meat and veggies. I usually buy 2 packs of red and yellow paste at the supermarket, among other instant sauces I stock in the pantry. Gauge how much potatoes and carrots you want to cook for this serving. Cut/chop all veggies and chicken fillets. Set heat on high, add in chicken cut-ups and sear. Cover pot and let it cook for about 20 minutes. Let it simmer then lower heat. Pour hot water and red curry paste. Mix well. Taste and add more curry paste if desired. Add the rest of the veggies and leave for another 20 minutes. 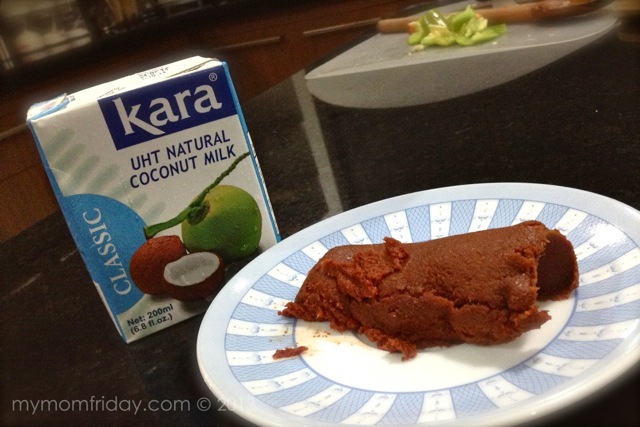 Pour coconut milk and mix. Simmer for another 5 minutes. 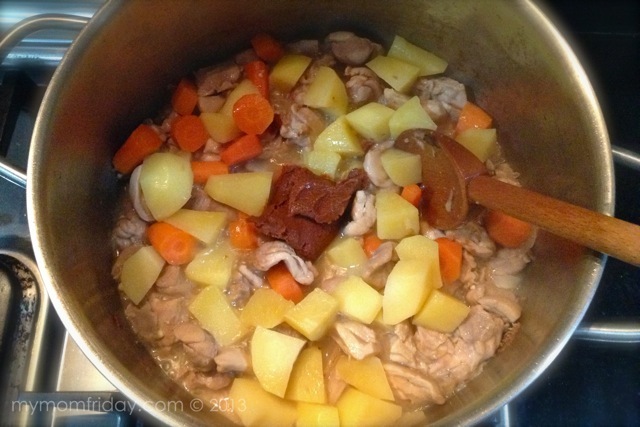 Taste and adjust level of heat to your liking - add more curry paste or more coconut milk to temper the heat/spice. Feel free to use chopped whole chicken, bone in. It's actually more flavorful. I used fillets since it cooks faster. And if you want more veggies, you can also throw in some sweet peas to the mix. For me, curried dishes are best eaten with roti. 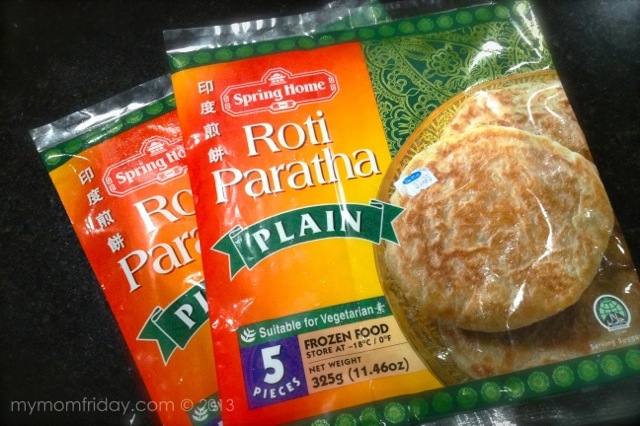 This ready-to-toast Spring Home Roti Paratha, which I also featured here long ago, is our favorite. Aside from having roti for breakfast or snack with just butter and sugar, I always prepare this to match our chicken curry. 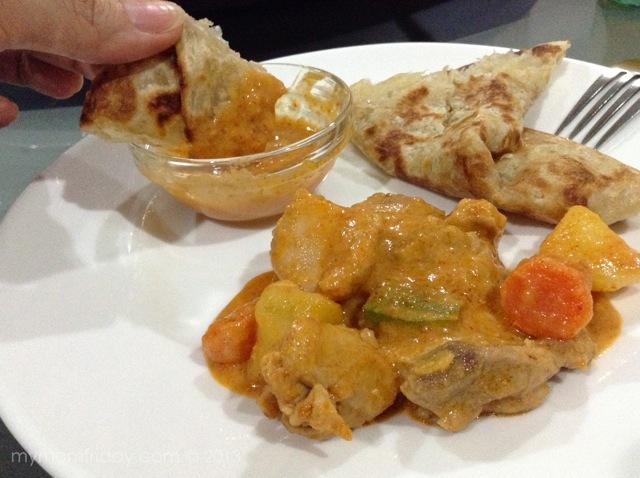 I make sure to have a side of curry dipping sauce for the roti too. Yum-yum!!! 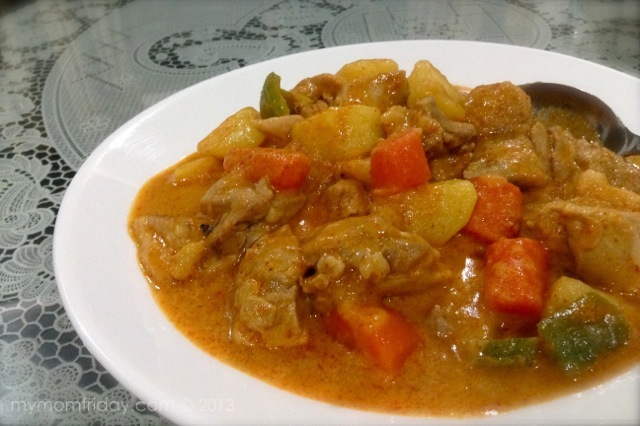 Do try this easy red curry dish if you like some heat in your meal.